You’re walking down the street with your kids and a panhandler asks you for money. Like many people, you feel torn. Part of you feels empathetic and part feels uneasy. You want to help the person, but the problem feels so much bigger. Parents spend a lot of time teaching kids good values like sharing and compassion for those in need. But when we’re faced with a homeless person, what behavior do we model for them? Nothing. Ignore. Turn a blind eye. Make negative comments about litter along the highway. Kids are beautifully free of cynicism. They don’t understand things like drug addiction or mental illness. All they know is that someone needs our help, and Mommy and Daddy are ignoring them. How should we talk to our kids when we encounter the hungry and desperate in our community? 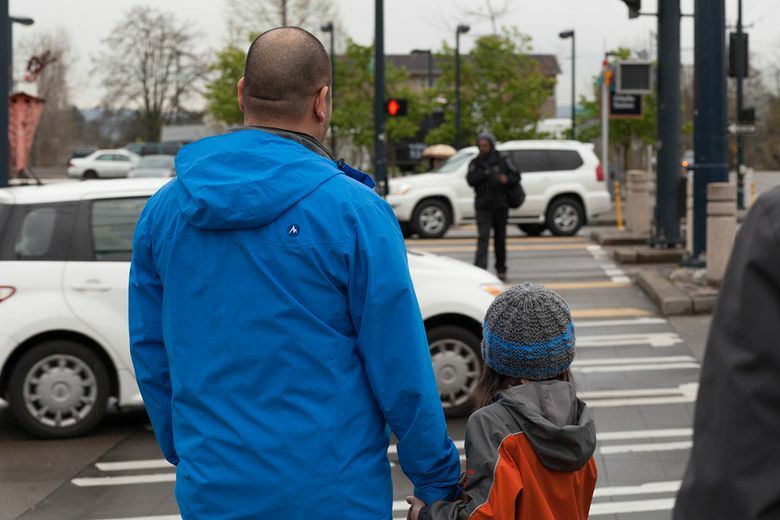 Jeff Lilley, President of Seattle’s Union Gospel Mission, looks to a pattern he sees in Jesus’ life when deciding how to respond: he sees someone, he feels for them and then he acts. Homelessness is a part of urban life. Living in a bubble isn’t an option. How parents respond will set an example. You must decide how friendly or cautious your family will be, but remember whatever choice you make is setting an example. One day he said good morning to a woman who ran across the street in terror. He wasn’t looking for a handout, just trying to say hello. “It devastated me,” he says. It’s important to view someone on the street as a person, not as a problem. In the moment, it may not be wise to hand out money and you may not have any food you can share, but you can encourage empathy and discourage making fun of homelessness. Show kids that it’s OK to feel heartbroken for another person. They’ll notice if you allow their plight to stir your soul. When you talk to your kids, Lilley recommends phrases like, “I think it’s sad that this person doesn’t have anywhere to live.” This will create an opportunity to talk to your kids about homelessness, and show them you care. The most important thing you can do is to take action. Lilley says that taking action as a family will help further your kids’ compassion and help little ones express their feelings. Here are some ways you can help them show love to others. Donate Suggest giving a portion of their allowance or Christmas money to an organization that helps the hungry. Serve meals The Mission’s Hope Place and Youth Services are safe places for kids to volunteer to help the city’s homeless and youth who are at-risk. Make meals Search and rescue volunteers from the Mission canvass the city helping those in need. Making sandwiches that they can deliver is a way you kids can help the most vulnerable. Create birthday and Christmas cards Both are simple ways to show those in need that someone cares for them. Thanksgiving placemats Kids can color a placemat to help bring joy to a homeless person this Thanksgiving. Hygiene kits Collecting everyday items like toothpaste and shampoo will help meet a person’s most basic human needs. Share with others Many feel challenged about how to teach their kids about poverty. Share this article or a brief video to keep the conversation going.